Kat Howard’s short fiction has been nominated for the World Fantasy Award, anthologized in best of and annual best of collections, and performed on NPR. 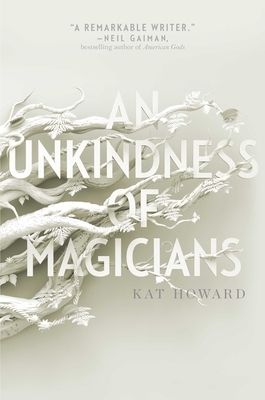 She is the author of the critically acclaimed Roses and Rot and the Alex Award–winning An Unkindness of Magicians. She is also the writer of the Books of Magic series, set in the Sandman Universe. She lives in New Hampshire, and you can find her on twitter at @KatWithSword. "Strong characters and a captivating revenge plot make this a fun, absorbing read for those who like their magic, and their magicians, dark and twisty." "This is an amazing book filled with magic, consequences, and what happens when you fight rather than turning away. This is Omelas, for magic. This is the price that must be paid. This is the story the others forgot to tell." — Fran Wilde, award-winning author of UPDRAFT, and HORIZON. "Howard’s vengeance-fueled urban fantasy is stylish, macabre, and spellbinding." "The characters and the Unseen World flourish in her gorgeous prose." "An Unkindness of Magicians will please fantasy fans, but mainstream readers looking for mystery, mayhem and a strong female protagonist will fall in love with it as well."